Our mini golf 3 Hole Putting Course is a great golf game where ever you want it. School parties, corporate events, any kind of party could always use some mini golf. This 3 hole putting course creates excitement with all the guests at your event. We now offer 3, 6 or 9 hole mini golf games. Great for high volume events, or even someone who needs a little practice on their short game. Be the host that stands out for having the mini golf course brought to your party! 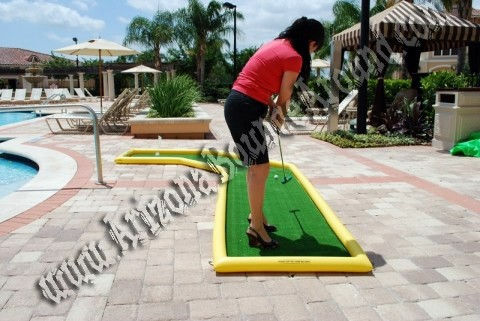 Rent a golf game for your next party in Phoenix Scottsdale AZ from Arizona Bounce Around today. Great office party rental ideas in Arizona. Check out our inflatable sports games for even more excitement.